Fashion writer and blogger Linda Grant has a very interesting piece in The Telegraph about iconic designer Jeanne Lanvin. Think a lot of today's ads are offensive? The Daily Mail has a great feature on misogynist ads from the classic age of advertising. The Beauty Brains provides scientific backup for the efficacy my favorite moisturizing product ever: Olay's In-Shower Body Lotion. The New York Times reports that nostalgia for the U.S.S.R. is the hot trend in Russian fashion. 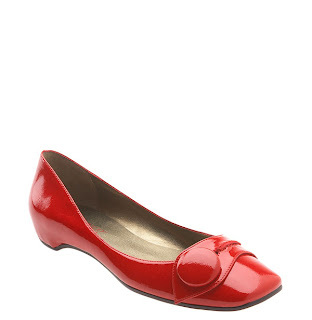 I'm a college girl in Indiana, and with winter fast approaching, I'm on the lookout for a pair of cute "going out" shoes. I already have a pair of brown leather boots, which are great for really wet or snowy days, but I'd really like something more fun and dressy, without being totally inappropriate for the weather. Any suggestions? Good question, Alyse! I always have a hard time walking the fine line between being fashionable and dressing appropriately for the weather. You obviously want to stick to closed-toe shoes, preferably with a sturdy heel (sky-high stilettos+icy sidewalk=accident waiting to happen) and made of a water-resistant material. 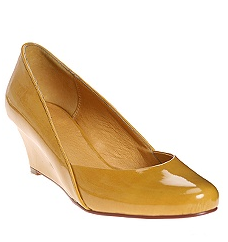 My go-to shoe in wet weather is a pair of bright yellow patent leather platforms (the heel is only an inch or so high). Stay away from soft leathers and suedes, which will stain, and be on the lookout for any shoe with a textured or rubbery base, which will help you keep your balance on wet pavement. Reader Question: Do Aspirin Masks Work? Hi Rebecca! Your e-mail made me nostalgic, as it reminded me of a stage I went through a couple years back where I was obsessed with aspirin masks. It all began when I got hooked on the Makeup Alley skincare message board, which is a fabulous resource for discussing products, but also very addictive. The problem with highly specific message boards is that there's a group mentality that forms, and when everyone on the board is raving about some product or trend, you start to feel like you're the only person in the world who's not in on the action. The aspirin mask was the first trend I got sucked into and for a few months I was using them 3-5 times a week (far more than anyone probably should). I think that they are an effective spot treatment for acne (do NOT try one if you have dry or normal skin, it'll dry you out) and they did make my skin look smooth and "glowy," which was nice. The effect is pretty short-lived though. It was great to put one on before I went out for the evening, but by the morning my skin looked normal again. Back to the issue of efficacy... aspirin is made out of salicylic acid (aka BHA or beta hydroxy acid), the same chemical used in many drugstore and prescription acne products. Salicylic acid works by exfoliating the cells of the epidermis, which is great for clearing out a whitehead or blackhead (my zits definitely cleared up faster than usual when I used it). It also supposedly helps improve the appearance of wrinkles and mild pigmentation in skin. You can learn more about BHA here. The downside is that it's very drying, and no matter how serious your acne is, when you strip your skin of its natural oils, it overcompensates by producing more. I used a ton of different acne products when I was younger, but the only thing that made a real difference was by using a gentle facewash, a moisturizer with sunscreen and two prescription strength products (Retin-A Micro and Duac). Ironically, using a non-comedogenic moisturizer has really been the key to my skin improvement. If you're going to use an aspirin mask, I recommend not using it more than once a week or so. You could also just use it as a spot treatment. I've read a lot of reviews online by people who say they use it daily, but that seems really excessive to me, and it certainly dried my skin out when I did that. To make an aspirin mask, crush up UNCOATED aspirin in a tiny bit of water to create a paste. I liked to add a squirt of Cetaphil (or another gentle cleanser) to prevent the mask from flaking or falling off. Make sure it's not too watery and apply it to your face, being careful to avoid the area around your nostrils. When the mask dries you can end up inhaling little bits of aspirin and that isn't good for you (I got headaches a couple times from having the mask on for too long). 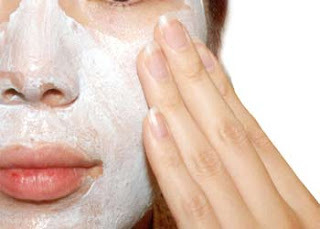 After 5-10 minutes, get your hands wet and gently massage the mask to exfoliate and then wash it off (again, being careful not to get anything in your mouth or nose). Keep in mind that you will look ridiculous while this mask is on (it's very crusty and weird looking and I know I freaked out a number of my hallmates when I walked back and forth to the bathroom with it on). I eventually gave up on the aspirin masks because I was lazy and embarrassed to look like I had wet cement on my face all the time. Also, crushing the aspirin and getting powder all over my room made me feel like I was some kind of drug dealer. If you've got acne-prone skin that isn't sensitive, I'd recommend giving it a try sometime to see if you like it. It's also just about the cheapest mask you'll ever use, and often more effective than the pricey brands. Has anyone else tried the aspirin mask? Love it or hate it? When I first came to Smith three years ago, I thought that one of the benefits of going to a women's college would be that most of the time, I wouldn't need to consider what boys would think of my outfit when I got dressed in the morning. I could wear pajamas to class without second guessing what my crush might think of me, I'd never have to be self-conscious about not wearing makeup. It wasn't long before I realized that the benefits of looking put-together extended well past getting guys to like me. Even if I spend most of my day in the company of women, I still make sure that I leave the house every morning (or at least most mornings) feeling good about what I'm wearing and how I look. When I'm happy with how I'm presenting myself to the world, I feel more confident and self-assured in all my actions throughout the day. Even though my daily wardrobe is pretty basic (usually consisting of a sweater, jeans, flats and a dressy coat), I feel 100 times better on days when I put a little effort into my look than when I spend the day in sweats. And I really believe that other people (mainly my classmates and professors) treat me differently when my appearance is more put-together and mature. I think that part of growing up is recognizing that it's far more fulfilling to dress for yourself than to dress to impress other people, particularly men. 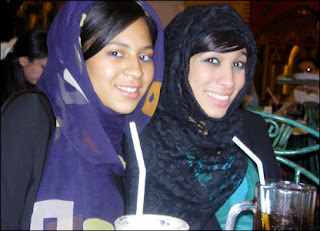 I got to thinking about this topic when I read this recent Fashionista post which discussed how many Middle Eastern women incorporate fashion into their lives, even if it's hidden under a robe or only shown to other women on special occasions. The article referenced in the post mentions how many teenage girls own Western clothing that they only wear in the privacy of their bedrooms. There's no question that fashion is transformative and empowering, but it's interesting that the effect is still so strong even if no one else sees what you're wearing. I'm not a big lingerie person, but I have a number of friends who love wearing beautiful lingerie on a daily basis, and I think it follows the same idea. When people say that women dress only for other women and not for men, I tend to think they're neglecting a third category- those who dress for themselves. I really think that if you polled that third group, they would have the highest levels of confidence and satisfaction. We've had a pretty mild fall and early winter here in New England, with just one weak dusting of snow that melted within a couple of days. I do a lot of walking around campus every day, and global warming or not, I certainly appreciate not having to trudge through a foot of snow in my 10 lb L.L. Bean snow boots. But just because we haven't been hit by any snowstorms doesn't mean it's not downright cold most days and every night; I've been layering like mad and I rarely go out without my gloves and a scarf. Despite temperatures dropping into the 20's, I'm shocked to see girls walking around in shorts. Though a few brave souls dare to wear them bare-legged, most people pair them with tights, ankle boots (the most hideous of boots) and sometimes Jane Fonda-esque leg warmers. Oh, the horror! Even if the shorts are made out of a heavy winter material, if they're in a dark color and if you insist that you're just as covered as if you were wearing a skirt... this look is just wrong. It's seasonally inappropriate and looks strange in the winter, especially when worn with 12 other layers and a heavy coat. And because shorts are one of the least flattering articles of clothing, very, very few people's bodies are flattered by this look, particularly if the shorts in question are pleated or high waisted, as I've often seen. I don't care if it's trendy or fashion-forward. I don't care if all the cool kids are doing it. If it's below 60 degrees, don't wear shorts! They're not intended for layering, and you risk hypothermia if you go out bare-legged, not to mention being written up as a crime against fashion. What to Wear with Navy? The contents of my closet are divided into two sections (figuratively, I'm not that organized), things that go with black and things that go with brown. Partly because I'm so Type A, partly because I'm not a particularly inspired or creative dresser, everything I buy has to match either the black or brown accessories and accent pieces in my wardrobe (I also have a soft spot for grey, but grey is close enough to black to match that half of my clothes). Everyone says that neutrals match anything, but I really can't get on that bandwagon. For this reason, I've never bought a suit, dress pants or work-appropriate skirt in navy. To introduce navy into my perfectly bisected closet would inevitably result in chaos. I'd have to desegregate the black-matching and brown-matching clothes to create a list of pieces that would go with the navy item... it's a lot of effort for one measly pair of pants. 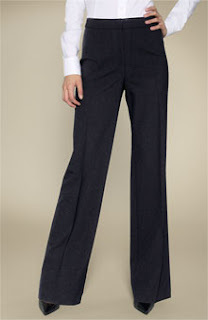 So when my friend Karen e-mailed me last week to ask about how to accessorize navy pants, I was initially at a loss. As she put it, "I'm all about the black pants and when I think my co-workers are wondering whether I own just one pair of pants, I pull out the navy ones. Do I have to buy navy shoes and socks to match? With a drawer full of black socks/stockings and more than one pair of black shoes, I'm loathe to spend money on the rare foray into blue-ville. And how do you match the many shades of blue?" 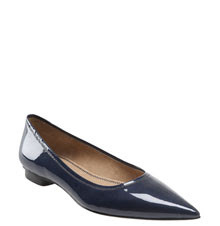 As much as I like matching things, the idea of navy shoes with navy pants conjures images of those eccentric old ladies who wear the same color head to toe. 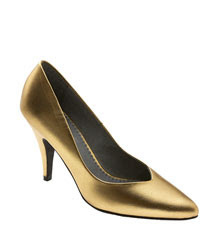 And for some reason, I find navy shoes to be unattractive in general... something about navy leather just looks strange. 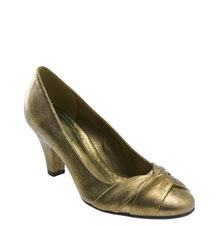 I told Karen that under no circumstances should she have to spend money on shoes that she'll wear with just one pair of pants. But I also think that black and navy are an unappealing color combination. They're like pink and red, too similar to compliment each other but not close enough to match. Plus, no one wants to resemble a bruise. 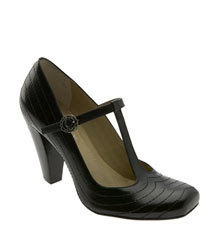 My recommendation to Karen was to pair rich brown shoes with her navy pants, a pair like these or these would look great. Brown with gold accents also looks really sharp next to navy. If it's summertime or you happen to live in a warm climate, white and navy are a classic color combination. 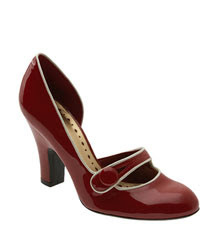 And if you're going for a more creative look, a yellow or red patent leather shoe could look great. What do you guys think? Any navy-lovers out there?